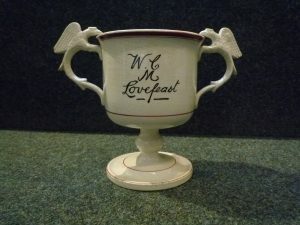 This two-handled loving cup was passed around at special Methodist festival meetings and comes from Middlesmoor Wesleyan Chapel. The Love-Feast, or Agape Meal, is referred to in Scripture several times and they were established by John Wesley (1703-1791) as days for promoting fellowship. Methodists gathered in an open chapel to reaffirm and strengthen their commitment to their faith, seeking to strengthen the bonds and the spirit of harmony, goodwill, and congeniality, as well as to forgive past disputes and instead love one another. Methodists came into the dale in the middle of the 18th century. Preachers from the West Riding found willing listeners, and they soon gained a strong foothold. John Wesley visited the dale on eight occasions, the first on 24th July 1766 when there was already a firm basis on which his movement could operate. Meeting houses were established in every hamlet, attracting many who lived close to the poverty line. Chapels followed in most of the larger villages and, by the 19th century, since nearly all the mill owners were Wesleyans, their workers followed suit. The chapels provided education and amusement, as well as moral instruction, and indeed, much of the social life began to centre round these houses of worship.